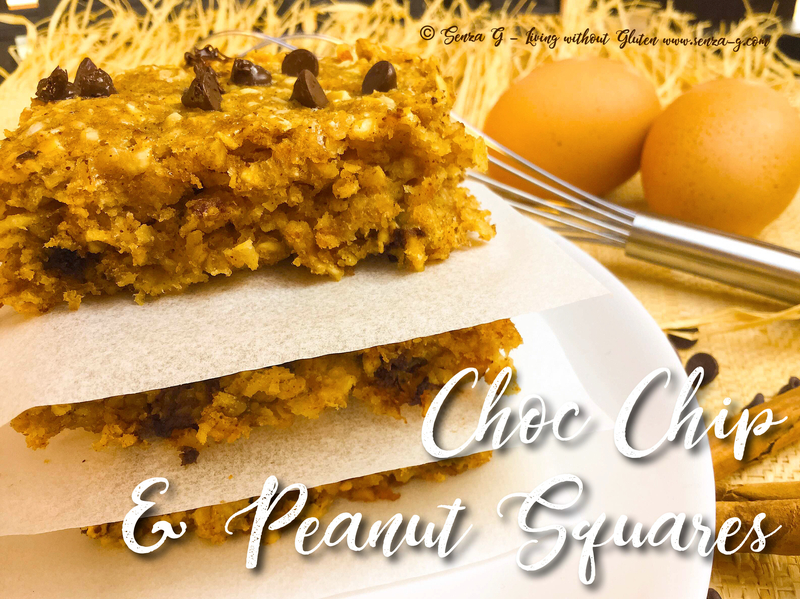 These gluten free squares are flecked with peanuts and chocolate chips and a delicious combination of other ingredients that am sure will quickly become a family favorite. Grease lightly an 8″ x 4″ baking pan. Set aside. In a large bowl, combine the oats, chopped peanuts, sugar, baking powder, salt and cinnamon. In a smaller bowl mix the egg, milk and vanilla essence and add these to the dry ingredients. Melt the peanut butter slightly in the microwave, adding to it the tablespoon of coconut oil and mix well until smooth. Finally add the mashed banana, the peanut butter and the chocolate chips to the bowl and combine. Pour this mixture into the prepared pan, leveling the top with a spatula. Sprinkle the extra chocolate chips on top. Bake for 20 to 25 minutes. Leave to cool slightly and cut into squares.